We were mesmerised when we first saw these beauties at the Cactus Garden in Cameron Highlands on 26th October 2013. Thought that they will grow only in the highlands and not in the lowlands of Kuala Lumpur where we are residing. It is the official state flower of Alabama. 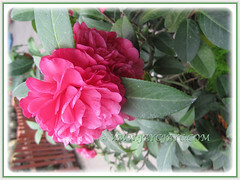 Botanical Name: Camellia japonica, followed by its cultivar name. 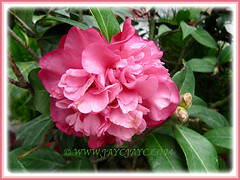 Common Names: Camellia, Japanese Camellia, Rose of Winter, Snow Camellia (named by the Japanese). Etymology: The genus name Camellia was named after the Jesuit botanist Georg Joseph Kamel. The specific epithet japonica was given to the species by Carl Linnaeus in 1753 because Engelbert Kaempfer was the first to give a description of the plant while in Japan. Origin: Native to China, Taiwan, Japan, southern Korea and the Indian Peninsula. Now cultivated worldwide. Plant type: An ornamental and flowering shrub. 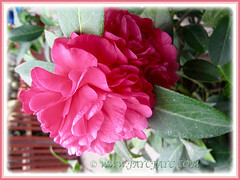 Features: Camellia is a genus of flowering plants that consists of about 100-300 species and around 3,000 hybrids. 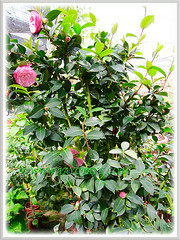 Camellia japonica is one of the best known species of the genus Camellia. Gardeners and horticulturists alike just love them and have created thousands of cultivars. Though slow-growing, it can reach 5 to 6 metres tall. The leathery and shiny deep to brilliant coloured leaves are evergreen, ovoid-shaped and have a sharp apex. The leaf margins is finely serrated. The leaves are arranged alternately with a centimetre long petiole to the small branches. Their flowers come in numerous variable colours such as red to pink to white and often times multi -coloured with stripes or speckled. Flowers can be single, semi-doubled or clustered blooms. Eventually, it’ll develop a fruit that consists of a globe-shaped capsule with 3 compartments, each with one or two large brown seeds. 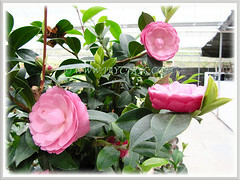 Culture (Care): Camellia japonica and its cultivars can be grown easily with minimum maintenance. Light: Best in shady to semi-shade or bright filtered light. Soil: Best with acidic soil, mulch-enriched as well as well-drained. You can also use bagged garden soil and mix with clayey soil. Others: Prune when necessary to encourage branching more flowers . Provide good air circulation by removing dead leaves as soon as possible and also to prevent root rot. Feed it once monthly with a balanced liquid fertiliser for flowering plants. Generally free from serious garden pests and diseases. However, do watch out for caterpillars of some Lepidoptera that will chew its leaves and infestation of aphids and tiny red mites on the buds and shoots. For subtropical and temperate regions: Hardiness: USDA Zone 7a to 10b. Advisable to water regularly but never overwater to prevent root rot. Allow the soil surface to be almost dry between waterings by sticking a finger into the planting mix to check. Feed and water sparingly during fall and winter. As captivating as the Roses, this plant starts to bloom from early spring to late winter. Propagation: Best to propagate from semi-hardwood cuttings. 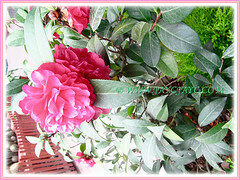 Usage: Camellia japonica has many uses.Can be grown in a pot or on the ground, even espaliered. Just an idea! In China, Camellia japonica had appeared in paintings and porcelain since the 11th century… maybe you’d like to try this out on huge murals if you’re an artist?